After a successful year, the makers of attractive, self-watering planters LECHUZA is pleased to announce it has expanded its range with the launch of ten new products. 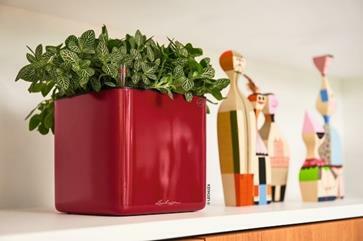 LECHUZA developed new lines of planters which are modern, sleek and timeless in design. The expanded ranges now available mean the company offers an ever-wider selection of colours, finishes and sizes helping customers achieve an instant ‘wow’ factor to any room, balcony or garden. The new CUBE Glossy 14 and 16 planters bring modern glamour to the living area. These come with high-quality lacquered surfaces, are gleaming eye-catchers and give rooms an elegant touch. Thanks to their practical size, they fit perfectly on windowsills, tables or shelves. With the new Green Wall Home Kit Glossy, an individual and space-saving wall greening is created in a flash and will become an instant show-stopper. Thanks to the practical magnetic holder, the popular CUBE Glossy 14 and the long CUBE Glossy Triple can easily be attached to the corresponding metal strip on the walls. The high-quality, extra strong magnets ensure a secure hold; meaning mini wall-hanging gardens can be created in an instant in your kitchen, living space or bathroom! Phalaenopsis and orchid plants add style and interest to any room and with the new LECHUZA Orchidea planter it’s never been easier to meet the demands of these beautiful and elegant plants. They include a special orchid substrate and the semi-transparent planter liner allows light to seep through to the roots. A staple of modern living is a straightforward style that does not require added design elements. This means turning your home into an individual paradise with just a few simple steps. The new YULA collection from LECHUZA fits in perfectly with this trend. 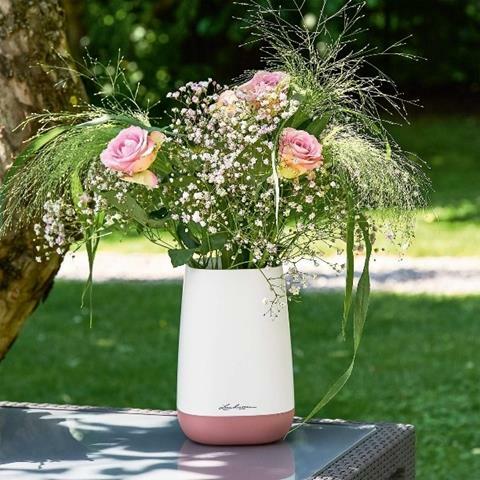 The YULA Flower Vase sets freshly-picked flowers in the scene and fits perfectly with other YULA planters in the same colours. With harmonious pastel colours, matt surfaces and clean forms, this decorative accessory can be integrated into any interior. Other new additions to the YULA range include the Plant Bag, Planter and Watering Can in the new colour white/rose. A classic balcony box has also been added to the range with the addition of the BALCONERA Stone planter. This comes in a versatile stone finish and it is available in various shapes and sizes, there is a suitable container for every design idea that spreads a rustic charm outdoors. Delicate early flowering plants, lush summer blossoms, autumnal arrangements or winterly plantings – the balcony box in natural stone look offers an atmospheric contrast to the plants at any time of year. The BALCONERA Stone is made of high-quality, weatherproof plastic, is lightweight and easy to transport. LECHUZA has simplified plant care and maintenance. All its products are made from high-quality plastic, recyclable, UV-proof, shatter-proof and weather-proof materials. The integrated water level indicator in each product tells you when it’s time for a re-fill, leaving you without the watering guesswork for weeks at a time. This means that plants achieve optimum growth and health, eliminating the possibility of over or under-watering. 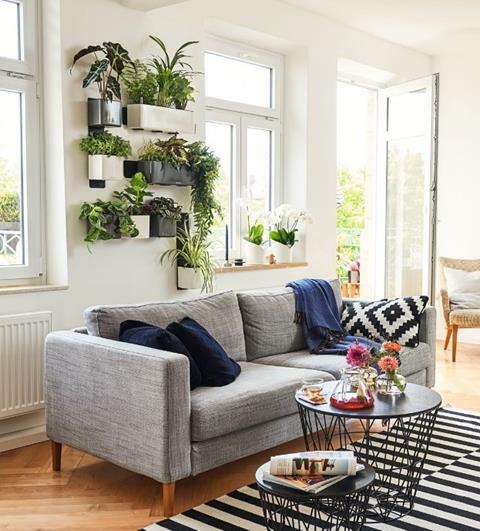 Unlike other products, LECHUZA planters are available in a range of sizes, colours and finishes, making them versatile and suitable for any room – big or small – and any taste. The new range of products is great gift ideas for upcoming events such as Valentine’s Day, Mother’s Day and Easter.